Conversation can sometimes get tense around the Thanksgiving dinner table. If you need to swing the conversation towards away from Uncle Bob's dry stuffing, why not share some of these fun facts? According to Roto-Rooter, the day after Thanksgiving is the busiest day for plumbers. It's not just your guests causing the problem, be careful about pouring grease and food particles down your drains. Roto-Rooter says it experiences a 21 percent increase in calls over the four-day weekend than any other Thursday to Sunday period in the year. In 1953, Swanson had so much extra turkey (260 tons) that a salesman told them they should package it onto aluminum trays with other sides like sweet potatoes — and the first TV dinner was born! There was a sudden rainstorm during the 1957 Macy’s parade. 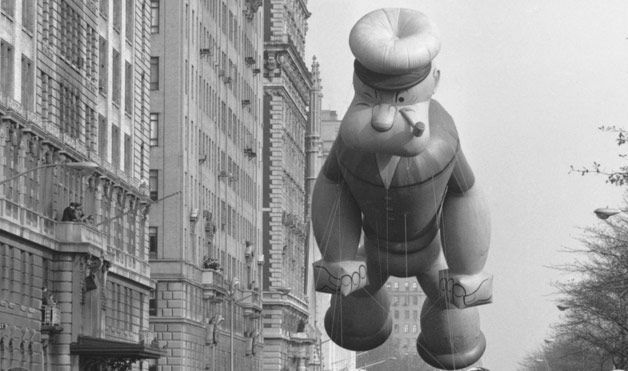 The Popeye float took the water in stride, collecting rain in the dip of his hat until it became too heavy for his rubbery neck to support. Popeye then dropped his head, flooding the crowd below in a gush of rainwater, then bounced back upright and began the process again. 5. It's not made out of pumpkin!